Does Fall make you want to get back to the basics of cozy living, and focus on your relationship with your kids? 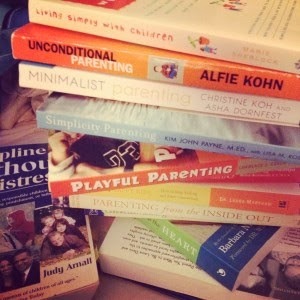 I wrote this piece to share my favorite parenting books on RichmondMom. You can read the full article here. The start of a new season inspires (and sometimes demands!) a new family routine or rhythm, especially the transition from Summer’s jubilee to Fall-time’s responsibility and refocus on life at home. As we march into Fall, I turn my attention from the warm, humid, and carefree adventures of a Summer spent out of doors, to the cool, crisp, and toasty retreat of September, October and November. For us these months of the year are about cultivating all that is good under our little roof, which includes quality time spent together being creative, sharing gratitude, experimenting in the kitchen, and creating a sense of tradition around the seasonal changes.